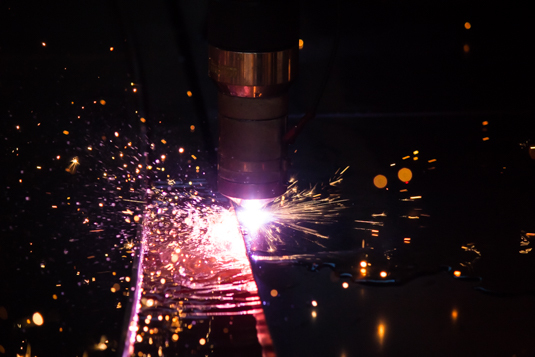 Armstrong Steel's Plasma line in action, cutting 3/8" plate for the manufacture of Armstrong Steel building rigid frames. Denver, Colorado – Armstrong Steel Building Systems, a Colorado company, is delighted to announce the opening of its manufacturing facility located in the Denver suburb of Englewood, Colorado. “Locating this facility in [metro] Denver was a no-brainer for us. 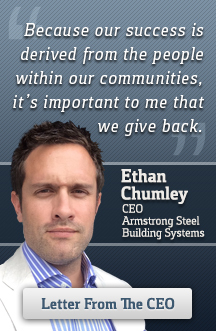 Colorado is our home, it’s always been good to us, and if we can contribute to the economy by providing jobs and tax revenue, we’re going to do it,” said Ethan Chumley, founder and CEO of Armstrong Steel Buildings. The plant will employ traditional manufacturing professionals who will be trained to work with state-of-the-art machinery. The company is no stranger to factory design and this facility is the next generation of manufacturing. Armstrong will offer training to Coloradans on new machines, with the latest advancements in technology, hoping to continue to do its part to keep Colorado ahead of the curve and on the cutting edge of job creation and manufacturing. Redirecting the company’s production to Colorado will allow Armstrong to modify processes as well as establish greater control over the timeliness and quality of the end product – something the company considers absolutely important to its customers and essential to its continued success in the market. Armstrong Steel’s website maintains an insistence on delivering a top quality product. Armstrong points out that the Colorado plant will mean the company can and will make consistent improvements, while retaining its competitive pricing and competitive advantages – even in the face of increasing steel prices.